Members of the genus Rhodococcus produce biosurfactants in response to the presence of liquid hydrocarbons in the growth medium. These biosurfactants are predominantly cell-bound glycolipids containing trehalose as the carbohydrate. Physiological roles of these glycolipids are diverse and involve participation in the uptake of water-insoluble substrates, promotion of the cell adhesion to hydrophobic surfaces, and increased rhodococcal resistance to physicochemical influences. In terms of surfactant characteristics (e.g., surface and interfacial tension, critical micelle concentration, emulsifying activity), Rhodococcus biosurfactants compete favorably with other microbial and synthetic surfactants. Additionally, biological activities of trehalolipids from rhodococci were revealed, including immunomodulating, antitumor, and anti-adhesive properties. Recently developed optimization procedures for their biosynthesis and recovery would broaden potential applications of Rhodococcus biosurfactants in new advanced technologies, such as environmental bioremediation, improved material construction, and biomedicine. 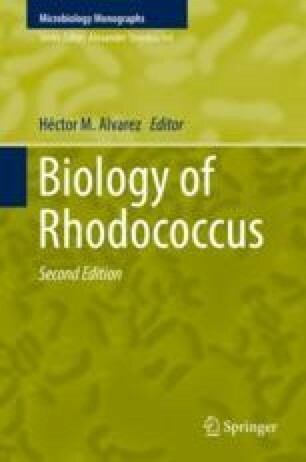 The present chapter summarizes recent research on Rhodococcus biosurfactants and focuses on biosynthesis features, physicochemical and bioactive properties, and their potential applications. This research was funded by the Ministry of Science and Higher Education of the Russian Federation (State Task Registration No. 01201353246 for IEGM and State Task 6.3330.2017/4.6 for PSU).